An ‘Indian Summer’ has set its sights on the Chicago area this week, and we’re not complaining. After a wet and drizzly Halloween weekend, Monday will kick off with sunny and dry start to November. Temperatures are set to come close to near-record warmth as well, with highs in the low-70s. Monday and Tuesday will reach a high of 72 degrees in some areas, dropping slightly Wednesday for a 71-degree high and Thursday topping off at an even 70 degrees. The record high for Nov. 2 is an extra-warm 78 degrees, and the Chicago area likely will not be hitting those heights this week. The chance to shatter a new record gets closer Tuesday, as Nov. 3 has a record of a 75-degree high, only 3 degrees off. 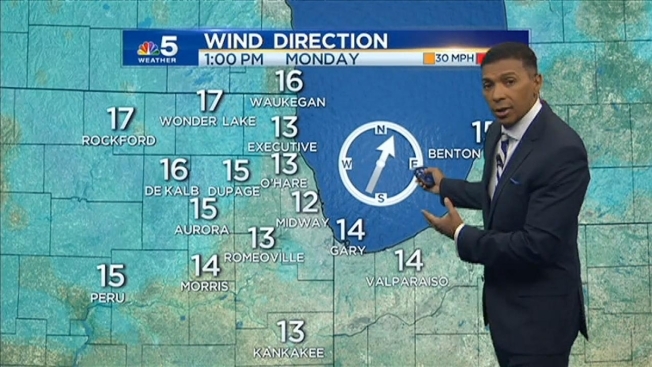 Monday will be sunny, breezy and unseasonably warm. Highs across the metro area reach low-70s. NBC 5's Andy Avalos has more from the forecast for the week ahead. As for Wednesday, we are only expecting to be 3 degrees away again from the record-heat of 74 degrees on Nov. 4. If we don’t hit that, the Chicago area’s opportunity to reach a new November record in 2015 will have passed, as the Nov. 5 high is set at a staggering and far-off the mark 79 degrees. Regardless, with no rain in the forecast, plenty of sunshine, subtle breeze and low humidity, the Chicago area will see a gorgeous start to November before it inevitiable cools down again. Monday: Sunny and cool in the morning. Mostly sunny, breezy and unseasonably warm this afternoon. Highs across the metro area between 69 to 73. Wind: SSW 10 to 15 with gusts to 20 mph. Monday night will be mostly clear and pleasantly cool. Inland lows in the mid 40, but low 50s city and lakefront. Wind: S 5 to 10 mph. Tuesday: Mostly sunny, continued breezy and unseasonably warm. Highs between 70 to 74. The record high for the day is 75, we'll be close. Wind: SSW 10-20 mph. Wednesday: Partly sunny skies, continued breezy and warm. Highs in the low 70s. Record high is 74. Thursday: Mostly sunny skies become partly cloudy; continued breezy and warm. Highs in the low 70s. Becoming cloudy with rain showers developing overnight. Friday: Overcast with periods of rain showers likely; breezy and turning cooler. Highs in the upper 50s, but falling through the day. Saturday: Mostly sunny, breezy and much cooler. Highs in the upper 40s. Sunday: Mostly sunny, continued breezy and cool. Highs near 50.